As IT teams want more detailed and accurate insights into their infrastructure, the DCIM market will evolve with more advanced monitoring features in 2017. In the modern data center, admins incorporate data center infrastructure management (DCIM) and other management platforms into existing infrastructures. The DCIM market, overall, is headed in the right direction, with adoption growing next year and beyond, said Christian Perry, analyst at 451 Research. "There's a desire to have a lot of granularity in terms of a view into what's happening within the data center from a resources perspective," Perry said." DCIM is exactly what's getting IT staff there." DCIM vendors should -- and likely will -- advance their tools' capabilities for data collection and capacity, as well as resource planning, said Jennifer Cooke, research director at IDC. "I think we'll see a lot more going forward. 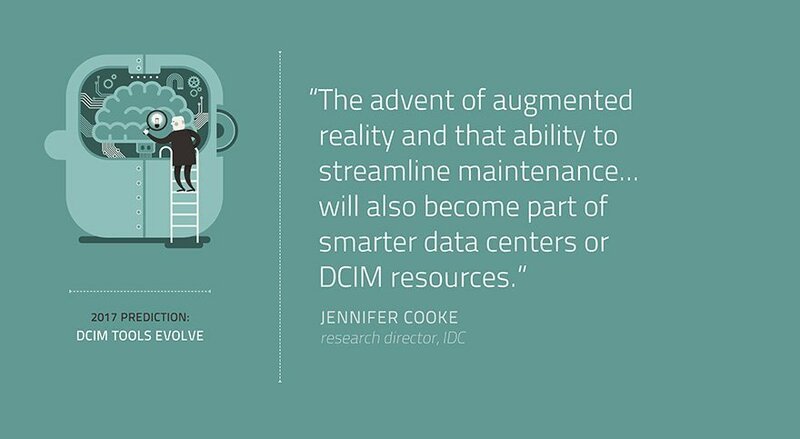 The advent of augmented reality and that ability to streamline maintenance [and] streamline this in remote locations, that will also become part of smarter data centers or DCIM resources," Cooke said. Still, to take full advantage of DCIM, organizations need to evolve their perceptions of what exactly DCIM tools deliver. "I think what a lot of people haven't fully come to grips with is the amount of time that it takes to get started with it," Cooke said. "It's been a little bit slow, but once people get their systems fully instrumented and the processes change, it's a big switch for people to go from a hands-on to a hands-off type of role." Many larger organizations have made DCIM commitments, but midsize companies should also identify performance metrics and needs through the use of DCIM tools, said Robert McFarlane, principal in charge of data center design at consulting firm Shen Milsom Wilke LLC, based in New York, and a TechTarget contributor. Organizations also should look into DCIM tools that they can expand over time, as their needs and budgets change. "Those who invest in what will give them the most immediate ROI -- which should be performance and reliability improvement, as well as energy reduction -- will be the most satisfied and the most likely to expand their DCIM over time," McFarlane said. What improvements would you like to see from DCIM tools?